This episode was a satisfying conclusion to the second story arc of this series, but I felt there were a lot of hanging threads and questions unanswered. 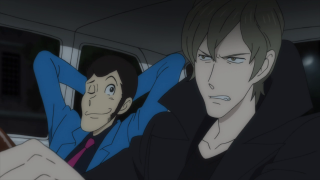 The Lupin/Albert team up is a far cry from our favorite lustful larcenist's nigh murderous rage just a couple of episodes. It seems like they're only putting aside their differences, or at least cooling down from where they were, because of their mutual interest in the black notebook, but by the end of the episode, you understand that the two bellicose blokes are actually rather fond of each other, or at least mutually entertained. I hope we see more Albert down the line, but we haven't seen Ami again, so who knows? At least their partnership here is fruitful, with both saving the other's lives, and also obtaining their sought-after treasure. The way they play off each other, with Albert a stylish, but ruthless sort, and Lupin mugging and poking at a frustrated Albert whenever he can. It's an interesting dynamic. 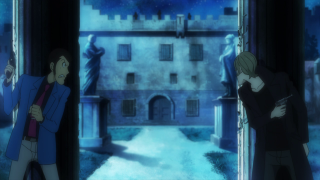 But if Albert was around more, it might make Lupin look less effective, so he can leave the series for a while. I have to express my sincere shock at the level of violence and bloodshed in this episode. Sure, Part IV had a bit, and it's not buckets of the red stuff like that Goemon movie Takeshi Koike made, but still, Lupin, Albert, and Goemon take no prisoners in this. We have one mercenary get cut in half, one is pushed into and killed with an iron maiden, and another is strung up to leave dying. It was almost overdone for this show. But lest us forget, our "heroes" aren't exactly the most merciful and beneficent individuals, and they're fighting for their lives here. I felt that the final showdown with Jose, the boss assassin, was a bit of an anticlimax, though. I mean, I liked the robot hand, but I felt that it paled in comparison to the previous bouts. His end is met pretty plainly, but screw him, anyway. Speaking of anticlimactic, though, I felt the subplot about the right wing politician amounted to little in the end. He was arrested? Why? Did Guillaume turn state's evidence, implicating Calvess? Was Calvess really also behind the bombings done by the terrorist organization? They didn't really go into the substance of Calvess' political machinations and how he planned to clamp down on immigration. It feels like the show kind of chickened out at the last minute from being politically charged. I mean, I understand why, you want to get as many viewers as possible, not divide the viewers of a normally apolitical TV show. It's just that, if they were going to go this way, they shouldn't have bothered bringing up the subject. If you're taking a stand, don't falter. Otherwise, just entertain us. Also, the production values were all over the place, as far as staying on model, and depiction of movement of vehicles. 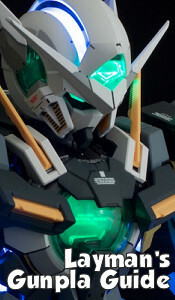 The staff overused the speed lines technique, which is better in homage, rather than a legitimate technique for a series in 2018. In contrast, many of the surroundings in wide shots, the settings, are gorgeous. The music is mostly on-point, even though there are few standout tracks in this episode. The voice acting does a lot of the work. So, while a good episode, and a good conclusion, I felt like this story deserved more. 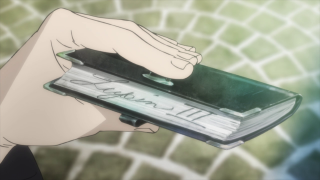 It would have benefited from an extra episode to utilize the established political angle (a public confrontation that sees Albert arresting Calvess, but failing to earn a higher position thanks to Lupin's swiping of the book, for instance). I'm not saying the episode wasn't engaging, but it was a lot of flash, and just not quite enough substance. 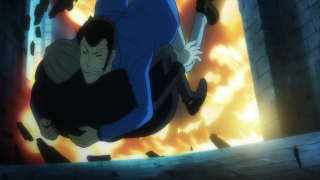 I mean, come on, we didn't even get answers on the whole Lupin/d'Andresy family connection or what Lupin did with the notebook. 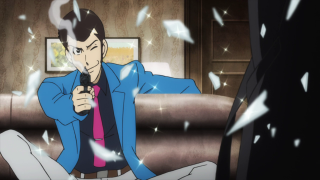 Anyway, next episode sees the return of Part II/Red Jacket Lupin. Awesome.